Children's Books Online: the Rosetta Project collects information about your transactions with us and with some of our business partners, including information about your use of products and services that we offer and if you choose, from our online survey. 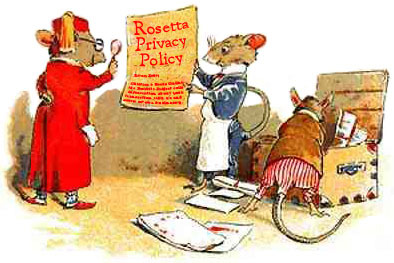 Children's Books Online: the Rosetta Project automatically receives and records information on our server logs from your browser, including your IP address, cookie information, and the page you request. Children's Books Online: the Rosetta Project uses information for the following general purposes: to fulfill your requests for products and services, and to improve our online services. We do not sell or share the data we collect.